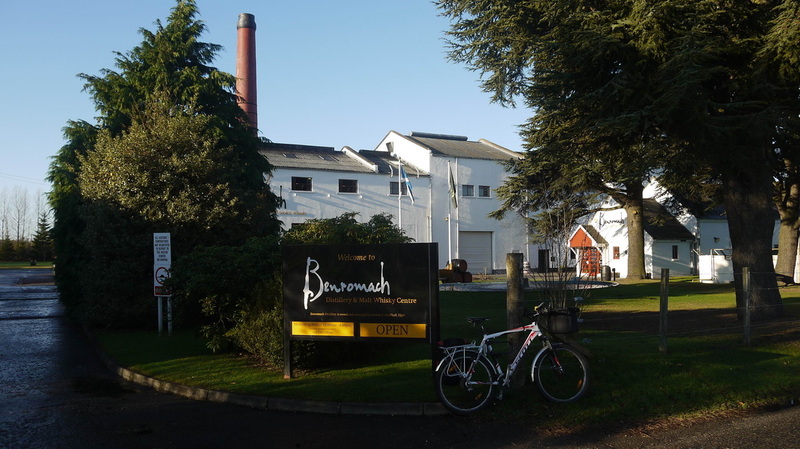 Forres is home to Benromach Distillery owned by world famous Whisky retailers Gordon & MacPhail. 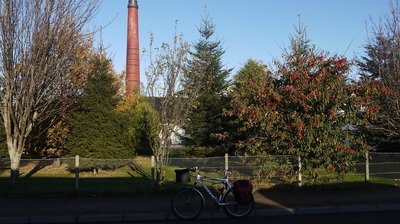 Glenburgie Distillery is two miles East of Forres - it is not open to the public. 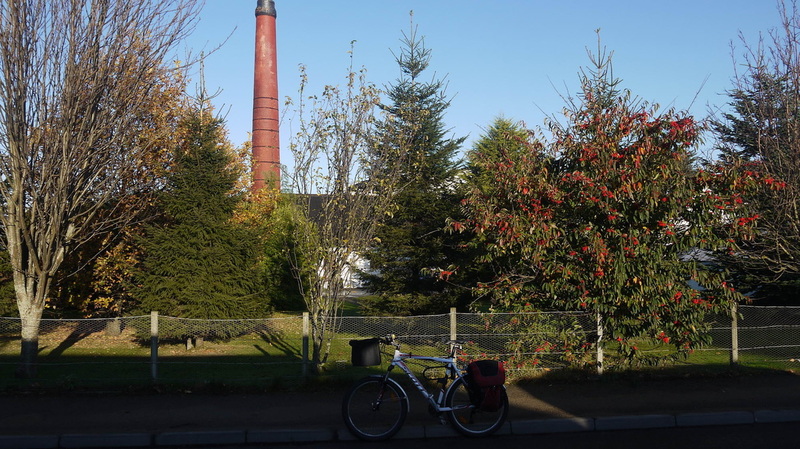 Dallas Dhu Distillery Museum is about a mile South of Forres. It closed as a distillery in 1983 and is now owned and run as a distillery museum by Historic Scotland. 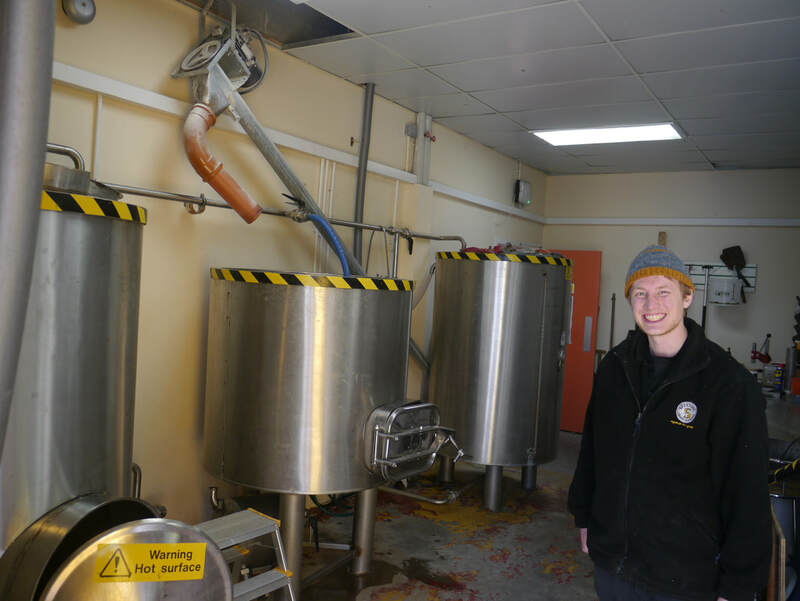 WhiskyCyclist stumbled upon the launch of the Speyside Craft Brewery at the Mosset Tavern on 21/11/12 and visited the brewery in April 2015. 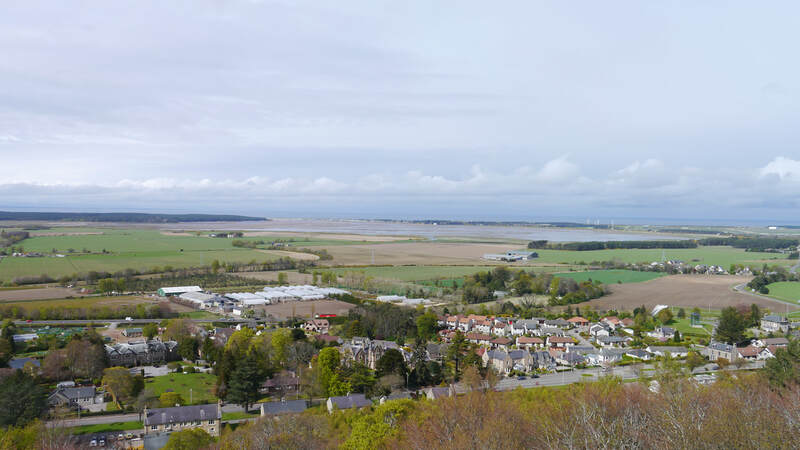 Forres lies just South of Findhorn Bay, and is thought by some to have been the "Varris" marked on a map made by Ptolemy nearly 2000 years ago. More recently (about 1000 years ago) Sueno's Stone, the largest sculptured stone in Europe was carved - it can be seen at the east end of the town. 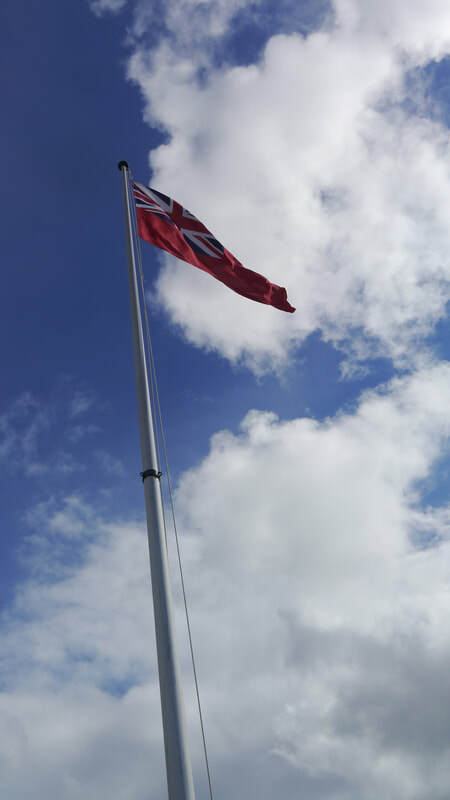 Barely 200 years ago a tower was erected above the town to commemorate Nelson's victory at Trafalgar, which afford's spectacular views of Findhorn Bay and the Moray Firth (open 2pm to 4pm, April to September). 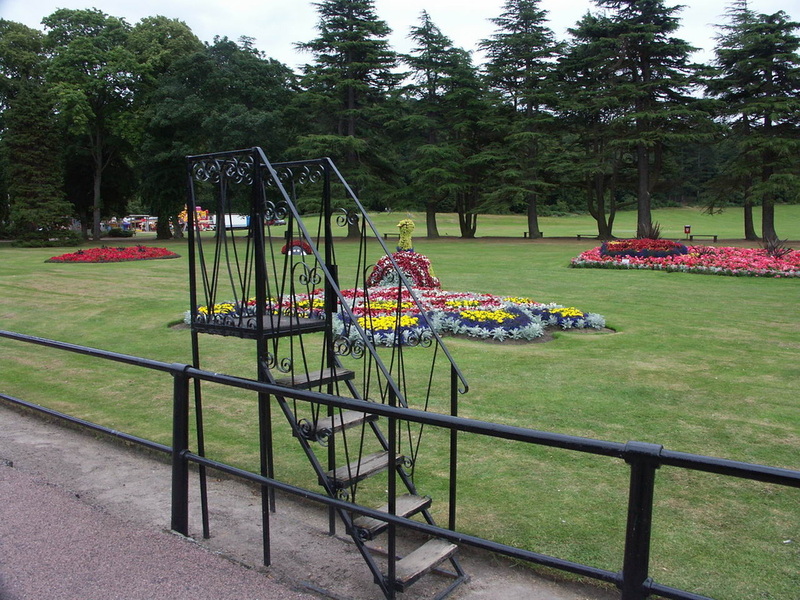 Forres is on National Cycle Route 1 and has many local cycle routes. Forres (FOR) station has level access to platform 1 and steps and lifts to platform 2. It has fairly frequent trains to Aberdeen & Inverness. Wikipedia. The station has been rebuilt close to its original site - to the right of the wall in the picture below. ​The Station plan has not been updated yet for the new (October 2017) station. Have stayed at this great B&B about 4 times now, always my first call for Forres. Only stayed here once, when couldn't get into April Rise, but it was also a great place - got a massive room, think I've got some pictures somewhere. Fairly basic menu, but good food, including a roast every day - they also do smaller portions at less cost if you're not too hungry. First visit here in November 2014 - food out of this world! And some great whisky too. Bar manager clearly knew what he was doing! Not quite the replacement for AmoRoma, but a good meal on a cold day. Eggs Benedict served on a crumpet was a surprise though! Now it's gone too. 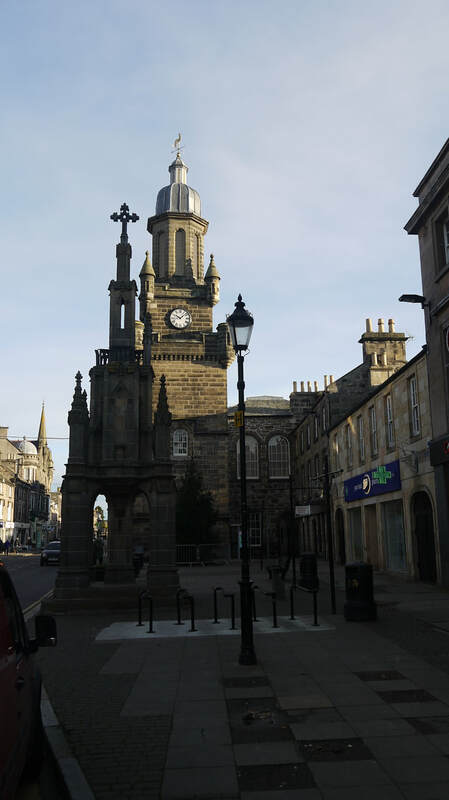 To understand some aspects of the history and geography of Forres, I had to research the history of railways in Forres. 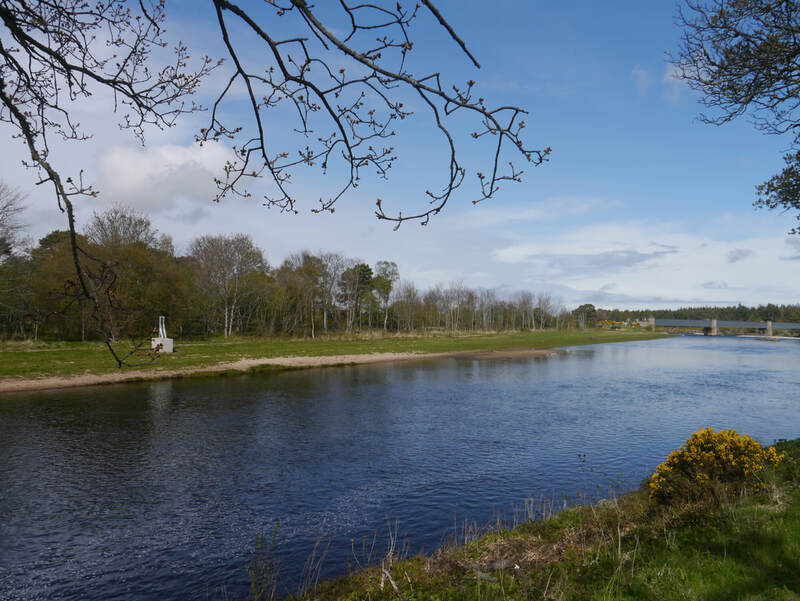 All transport from the South of Scotland had faced the major obstacle of the Grampian Mountains - or take the long way round via the coasts, but these routes provided other problems such as the River Spey. Road transport gave up on the great Firths of Tay and Firth until the 1960s making do with ferries or going inland as far as Sirling and Perth. The railway only successfully crossed these firths in 1887 and 1890 respectively. The line between Inverness and Aberdeen was built in small stages throughout the 1850s. 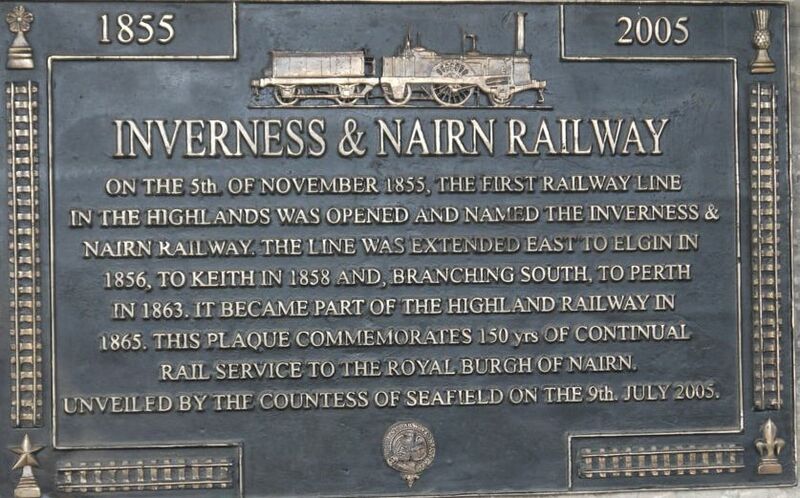 Inverness to Nairn was built in 1855, with intermediate stations at Culloden, Dalcross, Allanfearn, Gollanfield (all of which were closed by Beeching) and Kildrummie (closed 1880). The extension through Forres was built in 1857 as far as a temporary stataion at Dalvey, thence on to Elgin in 1858, and onto Keith later that year, where it connected to an existing railway to Aberdeen. Thus a through, though very circuitous line was in operation from Perth to Inverness via Aberdeen. The original station was at the end of what is now Market Street (not Inverene Road as suggested by Wikipedia), which was then named Station Road. 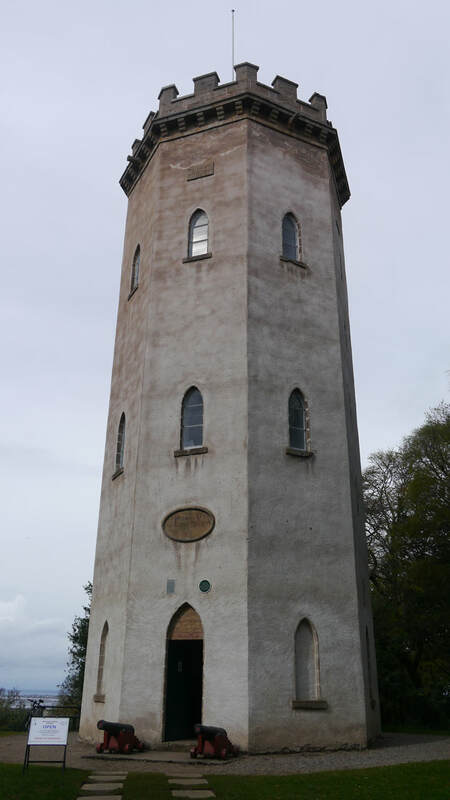 A road had been constructed through the Grampians, using Drumochter Pass and the Slochd Pass as part of General Wade's military road schemes, and this was upgraded as part of Thomas Telford's work for the Commissioners of Highland Roads and Bridges. The 1807 Aaron Arrowsmith map shows roads around Slochd similar to today's routes. It was still felt that to build a railway through these passes was too difficult - engines of the day wouldn't be powerful enough for the required gradients. By 1860 the Inverness and Perth Junction Railway felt it could build a line to considerably reduce the journey between the two cities. In 1861 an Act of Parliament authorised the building of a line from Dunkeld to Forres - Drumochter could be conquered, but Slochd was still too much of a challenge. Though Drumochter is higher, the route from the South was long enough to provide a shallow enough gradient, and North the descent to the Spey at Newtonmore was only down to 250m and the onward route via Grantown and Dava has a lower summit and gentler descent that Slochd. The line was opened via Dava, where there was a station, in 1863, and arrived in Forres (after passing the site of the yet to be opened Dallas Dhu distillery) at right angles to the existing line to the west of the first Forres Station. A new triangular station was therefore built at the junction on a loop off the original line. The name Station Road was now misleading, so it was renamed Old Station Road, and what is now Tytler Street was named Station Road. There being no by-pass for another 100 years this road lead right up to the station. (These names didn't last too long, perhaps they were still confusing, and the modern names were in use by the turn of the century). The new line considerably reduced the journey to Inverness, but it would nearly halve it again if a route via Slochd could be built. This took another 35 years, and the route swings out well to the east after Craggiemore as it descends the Nairn valley and cross that river on a viaduct in Culloden Forest and approach Inverness via Culloden, crossing and then joining the Inverness - Aberdeen line at Millburn Junction close to the site of the long-closed Millburn Distillery. The Dava line was therefore consigned to the role of a local line for the remaining 67 years of its existence, and Forres station's decline into a single platform remnant began. Picture of the old station before closure of the Dava main line. 1956 Picture. More pictures of the old Forres Station. At this stage the only one of the three roads leading to the railway from the roundabout at the end of Bridge Street that crossed the railway was Inverene Road, at the level crossing by Benromach Distillery which was taken out of use when the newest station opened in 2017. A bridge has now been built from the A96 to Waterford Road behind the distillery to replace the level crossing - the only map I've found showing this is the Open Street map.